If we're going to build cities on Mars, we must first figure out how to supply colonists with water and food. If underground Martian ice turns out to be as plentiful as some hope, we may have water covered. And now a group of Greek hackers has invented a device for growing food there, too. The device would be a solar-powered greenhouse for growing Greek spinach on the cold, dusty surface of Mars. It would be deployed ahead of future colonists, so that the spinach (or other vegetables) would be mature by the time people arrived. 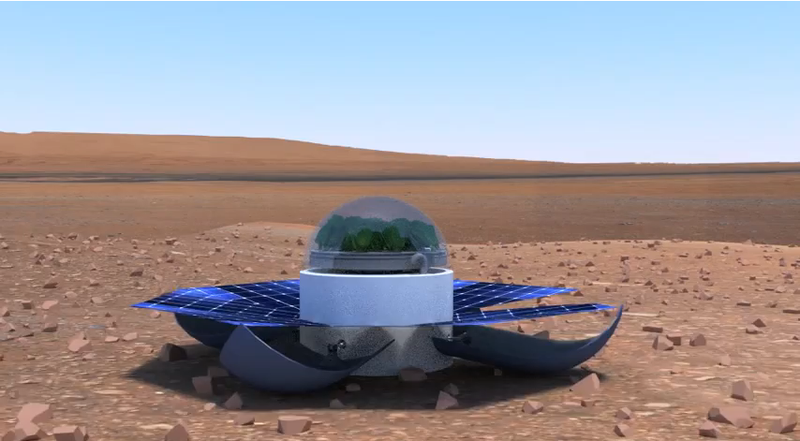 The device has the advantage of providing a sustainable environment for growing food, while also preventing contamination of Martian habitats with Earth life. The project (called “Popeye on Mars“) has been named a winner in the NASA International Space Apps Challenge, a competition that seeks to engage thousands of people around the world in space exploration. Capable of producing fresh spinach in just 45 days, the dome-shaped aeroponic growing system could be used for pre-deployment on a space mission to the Moon or Mars. The winning team met at an Athens hacker space to build the device. They explain their process in this video. Check out more winners in the Space Apps Challenge on the NASA site.